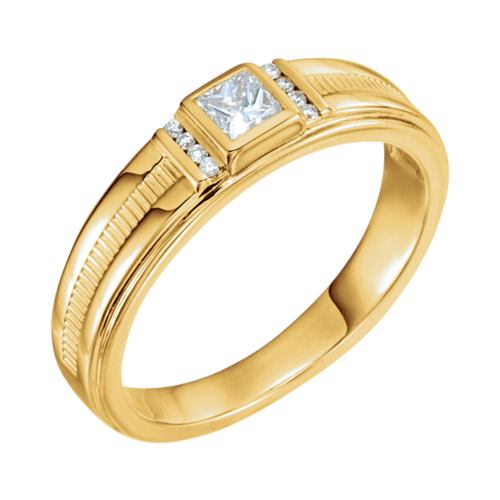 Men's Handsome 14k Gold Grooved Diamond band. This custom made to order ring available in 14k White or Yellow gold. Also available in Platinum. Center bezel set princess cut diamond is a VS1 clarity GH color stone measuring 2.5mm x 2.5mm and weighs 1/10ctw. Ring weighs an incredible 15.3grams. Sophisticated 14k White gold Blue Sapphire men's ring. 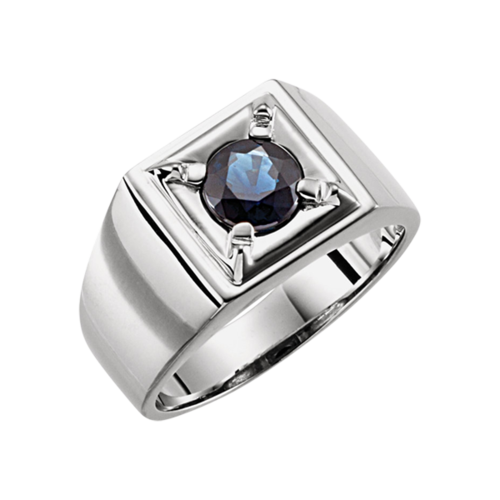 Very handsome ring features a 6.5mm genuine Blue Sapphire center. This ring measures 4.7mm wide at the base and tapers to 11mm on the shank near the top of the ring. Ring weighs about 9.45grams. 14k Gold Onyx men's ring. 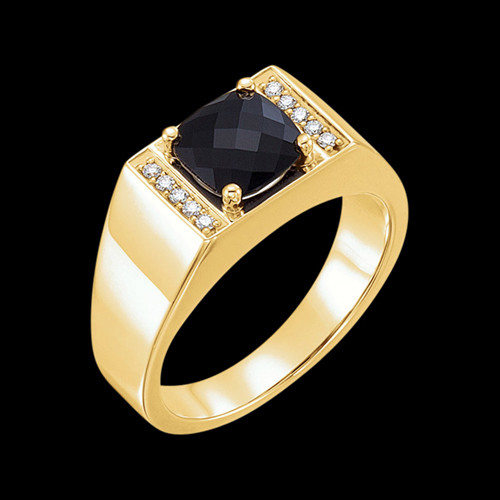 Another handsome design available in 14k White or Yellow gold, Onyx measures 8x6 oval. Ring is about 4mm wide at the base and 6.5mm at the shank. Ring weighs about 10.25grams. Very stylish, masculine men's ring. Handsome 14k Yellow gold diamond ring. This masculine design is set with a square diamond and accented either side with four round channel set diamonds for a total of 1/3ctw. Unique ladder details the center line in this ring. Ring weighs 7.4grams and is stock size 11. Additional sizes are available but custom and non returnable. Very handsome 14k gold Onyx and diamond ring. This men's ring features an Antique Square checkerboard cut 8x8mm Onyx accented with 1/10ctw diamonds. Ring is about 14mm wide across the top then a 6.25mm wide shank tapering down to 4mm at the base. Readily available in 14k yellow gold, special order 14k White gold or Platinum. 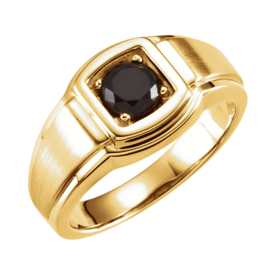 Sophisticated 14k gold Men's Onyx ring. This striking design features a satin finish with polished border and a polished frame around the 6mm faceted Onyx. 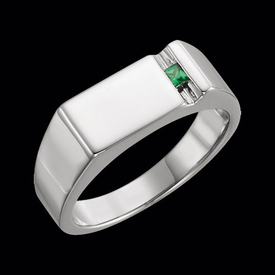 Handsome ring measures 8mm wide at the shoulder and 11.8mm wide across the top. Ring weighs a substantial 10.80grams. 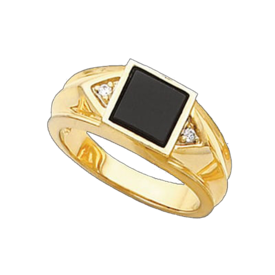 You'll love this very masculine men's onyx ring. Also available in 14k white gold. Handsome Men's family ring. Mothers have a ring to symbolize there family here is a perfect ring for Dad. This ring measures about 7mm wide at the shoulder and tapers to 4mm at base. Stones are 2.5mm square channel set. This design is available in 14k yellow, rose, or white gold (Rhodium plated for a bright white look,) can be set with 1 to 6 gemstones. Use our request email for pricing with your gemstone selections. Ring is about 2.15mm thick. A very handsome ring. Masculine 14kt yellow gold Men's Celtic inspired signet ring. This ring measures about 16.9mm long by 13.3mm wide. Ring weighs an incredible 9.66 grams. This ring is 10.65mm at the shank and tapers down to 4.5mm at the base. Ring is about 2.15mm thick. A very handsome ring. 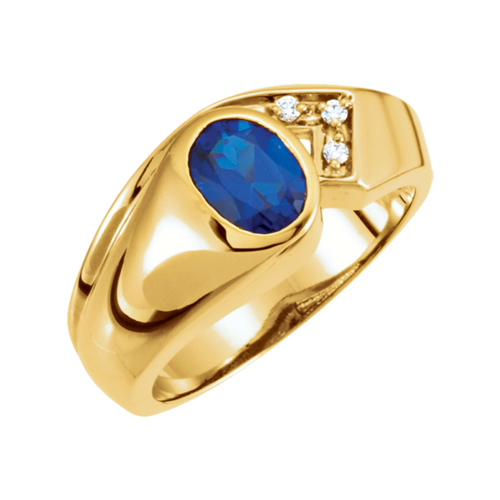 Indulge yourself with this finely crafted men's oval gemstone ring. Our price shown is with a Blue Topaz center weighing approx. 1.65ct and measuring 8mm x 6mm. This rings exciting design includes 3 dainty diamonds for a flashy accent. This is YOUR ring so you be the designer, rather have 14k white gold? Maybe you prefer a Sapphire, Garnet, or Tourmaline. It's your choice. You are the one buying the ring, get exactly what You want. Gold ring weighs 10.4grams before the center gemstone. This ring is also available in Platinum, email for pricing. 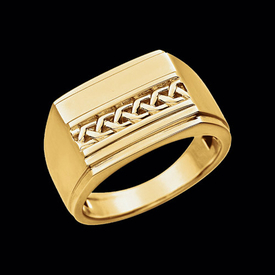 Masculine 14kt gold Men's grooved signet ring. This ring measures about 13.3mm wide and weighs an incredible 10.25 grams. This ring is 10.65mm at the shank and tapers down to 4.4mm at the back. Ring is about 2.4mm thick. A very handsome ring available in 14k white or yellow gold. Stunning 14k yellow gold, white gold, or Platinum diamond ring. Vibrant 1/2 carat center diamond is an SI 1 clarity G-H color stone. 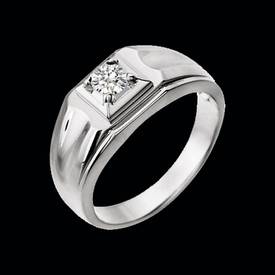 You'll love this sleek design men's diamond ring. Diamond ring is a custom made to order item. Handsome 14k yellow or white gold genuine onyx men's ring. Black onyx is an octagon shape and measures 12mm x 10mm. Ring design is open inside and weighs about 10.95grams. Onyx blends beautifully with gold in this men's ring. Custom made to order ring available in and custom size. This item is non returnable. Handsome 14k Yellow or White gold Onyx men's ring. Center Onyx is bordered either side with 2mm round diamonds. Diamonds total .18ct tw, this ring weighs 10.15grams. 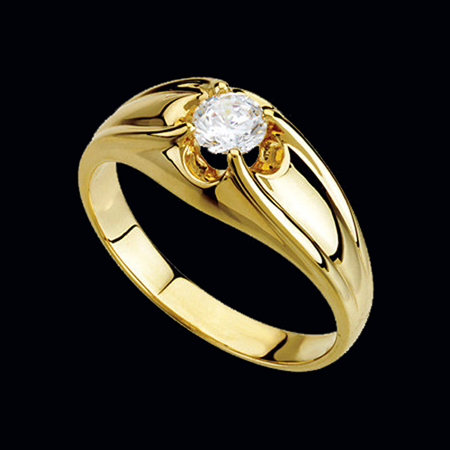 Ring design is available in 14kt gold's, 18kt gold's, and Platinum. 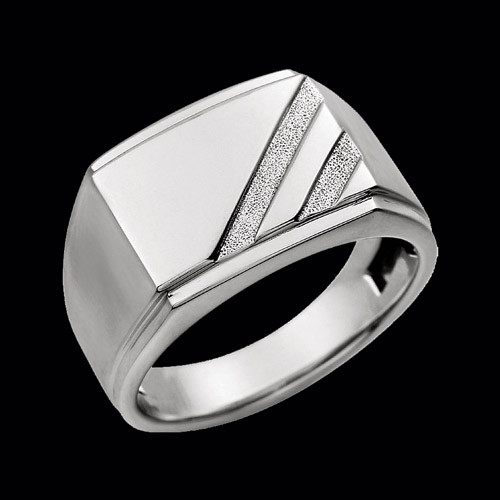 Treat yourself to this very stylish Men's ring. Finely crafted men's oval gemstone ring. 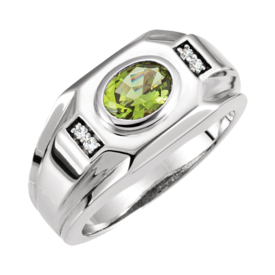 Our price shown is with a Peridot center weighing approx. 1.35ct and measuring 8mm x 6mm. This rings exciting design includes 4 dainty diamonds for a flashy accent, diamonds total .06ctw. This is YOUR ring so you be the designer, rather have 14k White gold, or 14k Rose gold? Maybe you prefer a Sapphire, Garnet, or Tourmaline. It's your choice. You are the one buying the ring, get exactly what You want. 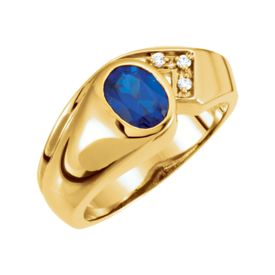 Gold ring weighs 11.2grams before the center gemstone. Love a stone we missed? Just email for a quote. This ring is also available in Platinum, email for pricing. 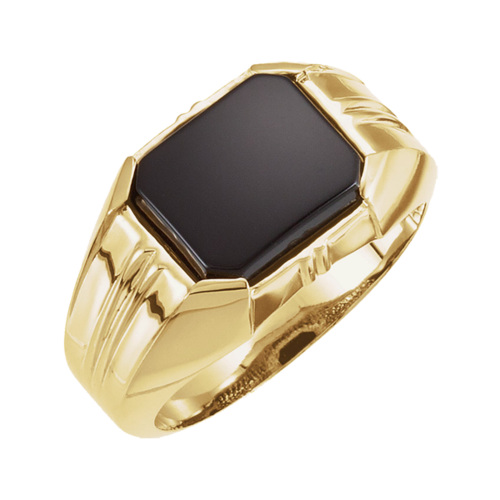 Masculine 14kt gold Men's signet ring. This ring measures about 16.3mm in length and 13.3mm wide. Ring weighs a nice 8.10 grams. This ring is 10.55mm at the shank and tapers down to 4.8mm at the base. Ring is about 1.9mm thick. A very handsome ring available in 14k white gold. Men's 14k White gold ring with yellow gold rope accent and a 1/4ctw diamond center. This great ring appeals to the rugged or sophisticated man with it's stylish design and bright diamond center feature. Ring is stocked in a men's size 10. 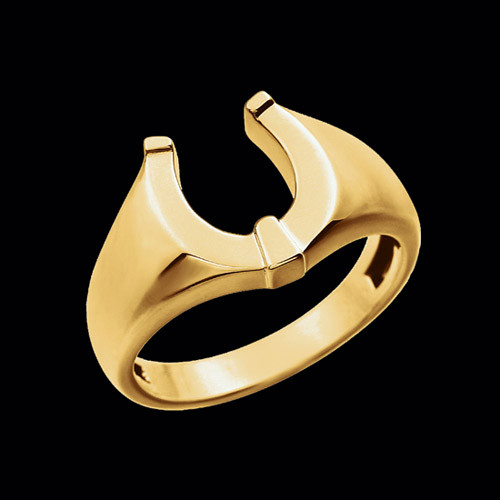 Handsome 14k Yellow gold Men's Horseshoe ring. This western style ring measures 11.35mm by 13.7mm wide. The should of this ring measures 8.5mm wide and tapers down to a 3.45mm at the base. Men's gold horseshoe ring weighs about 5.95grams. 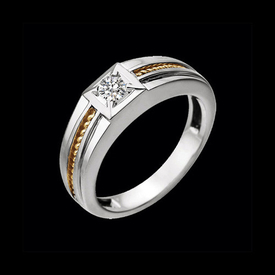 Men's stylish 14k two tone gold 1/2ctw diamond ring. Six diamonds totaling 1/2ctw are at this rings center and SI2 clarity HI color. Ring is a stock 10 and weighs about 6.67grams. 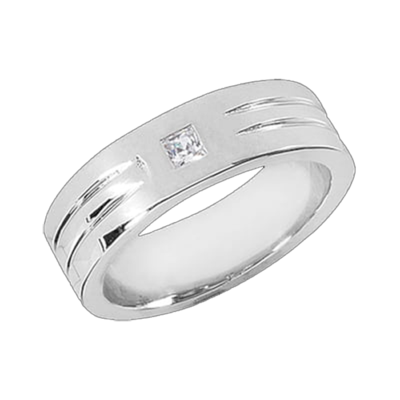 Very handsome men's polished diamond ring. 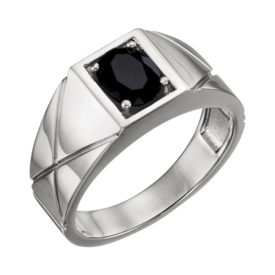 Handsome men's onyx ring. 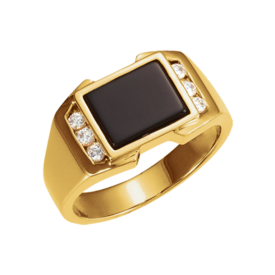 Our price shown is for the 14k yellow gold men's ring is set with a square 8mm x 8mm black onyx to create this very stylish men's ring. An accent diamond is set in a triangle shape on either side of the featured center onyx. This ring weighs 9.66grams. This ring is available in 14k yellow gold, 14k white gold, 14k rose gold, and luxurious platinum. Stylish 14k gold mens 3/8ctw diamond ring. This beautiful ring is available in 14k white or yellow gold. The center diamond is a 3/8ct tw that is I1 clarity G-H color at this price but, available with any diamond quality email for additional pricing.